Kasma took this picture of a young Hmong girl in January and this young girl is dressed up in her New Year’s finery. 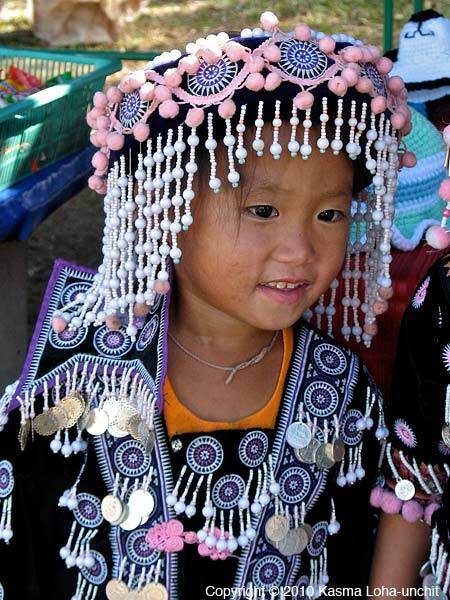 (The Hmong celebrate their New Year according to the lunar calendar). Recently looking at the Index of Wednesday Photos I realized that I’ve not really posted enough pictures of the people of Thailand, perhaps the best thing about the country. Every year Kasma takes her small-group trips to several hill-tribe villages, choosing villages that are not 100% dependent on tourism. This entry was posted on Wednesday, September 15th, 2010 at 12:05 am	and is filed under Travel, Wednesday Photo. You can follow any responses to this entry through the RSS 2.0 feed. You can leave a response, or trackback from your own site.